A blend of cypress and grapefruit is used in spa therapies for beautifying legs and hips. Derived from the branches of the tall evergreen tree, Cypress essential oil has a fresh, clean aroma that’s energizing and refreshing. Cypress is frequently used in spas and by massage therapists for its ability to soothe tight, tense muscles, and promote circulation. 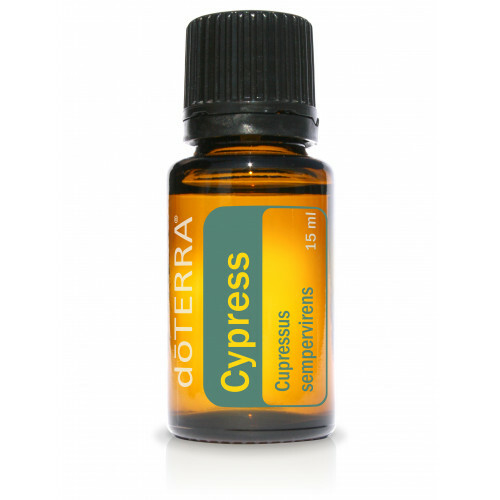 Cypress can be diffused or inhaled directly to assist with clear breathing and healthy respiratory function. It can be used as a throat gargle for these same benefits, but should not be swallowed or taken internally. Cypress contains monoterpenes, making it beneficial for oily skin conditions and to stimulate localized blood flow. It has a grounding, yet stimulating effect on the emotions, making it a popular oil to diffuse during times of transition or loss.